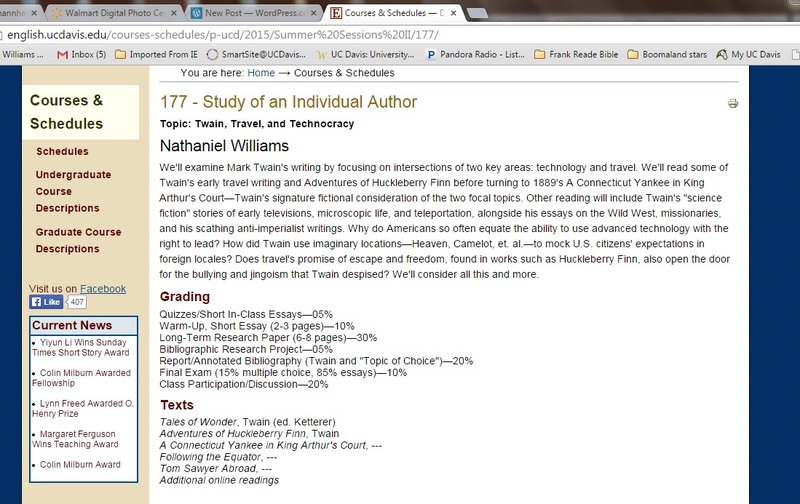 The course announcement for my UC Davis “Studies in an Individual Author” class on Mark Twain went live a few weeks ago. I’m posting the link and a screen clip here. We’re focusing on travel and technocracy, especially stories where travelers assume superiority over their hosts because their real/perceived advantages in technology. We’ll cover Huck Finn (travel and the promise of freedom), move to A Connecticut Yankee (travel and the use of technology as coercive force), and Tom Sawyer Abroad (Twain’s subversive take on technocratic dime novels), and read Twain’s non-fiction for context. The course will be during Summer Session II through the Department of English at UC Davis. We’ll cover three novels and one travel book (with lots of short stories and essay interspersed) in just six weeks! This entry was posted in All Posts and tagged A Connecticut Yankee in King Arthur's Court, ENL 177, Mark Twain, science fiction, technocracy, Tom Sawyer Abroad, UC Davis. Bookmark the permalink.